The Kuskokwim 300 and associated sled dog races out of Bethel this weekend depend on volunteer labor. Many of the veterinarians who check the animals before they compete volunteer for the race each year, some even coming from distant places in the Lower 48. For others, it’s a family affair. 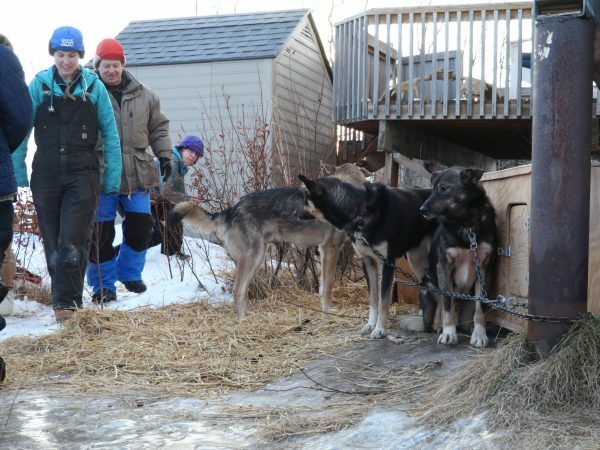 At a dog lot just off the highway, a group of veterinarians crouch down in the snow and willows to take a selfie with a sled dog and its musher. They repeat the ritual each time they finish examining a dog team, which entails listening to heartbeats, inspecting paws, and checking for injuries. “You’ve lived a big life there, buddy,” said volunteer Jackie Klejka with a small laugh to a dog named Buck as she looked him over. Klejka marshals the group of about a half-dozen vets, moving them to dog lots across town in her roomy truck. She started working with the race back in the early 90s. In those days, vets would fly in from out of town to help out. Klejka began coordinating the work, and over the years a veterinary program for the K300 has formed around her. An old colleague from Ohio flies in each year. Others are from Oregon, the Railbelt, and even just down the road in Bethel. In the days leading up to the start, the volunteer veterinarians make sure all the dogs competing in the K300 are healthy. During the race, vets are distributed at checkpoints up and down the river to examine dogs as they race through. “It’s just a service that the Kusko provides to make sure we have the best dog care,” Klejka said. It’s a labor of love, and one she is passing along. Klejka’s eldest daughter Jessica, a veterinarian who lives in Wasilla, comes back yearly to volunteer with the race. As the group of veterinarians hunch over a string of dogs, Jessica pulls up in a truck, straight from the airport. It’s her first stop upon arriving home. In a worn pair of brown bibs, she strides right over to the team and starts examining the dogs, so intent that she walks right by her mom without saying “hello” until a few minutes later. Jessica Klejka grew up mushing her parents’ dogs, competing in the Kusko races and Junior Iditarod. Now she works as a veterinarian, mushes a team of her own, and is preparing for her rookie Iditarod run. But first, she comes back home to lend a hand. The younger Klejka credits the K300 races with fostering a strong mushing community across the Yukon-Kuskokwim Delta. She attributes the race’s reputation, in part, to the commitment of volunteers and community members. The K300 starts Friday. A winner is expected Sunday morning.